Want to study a Master’s in marketing management in Birmingham? Our MSc Management and Marketing degree is accredited by the Chartered Management Institute (CMI). Our MSc Management and Marketing course teaches you the fundamental skills and attributes you need to become a successful manager and marketer. You will learn how to negotiate the challenges and issues that international businesses face, as well as having the option to learn how to become adept at marketing. You will experience working in internationally diverse, team-based projects, collaborating to deliver professional reports and presentations as part of module assessments. These assessments will reflect the professional practice of international management. Throughout the course, the course team will give you the support you need to realise your potential and we look forward to working with you to develop your knowledge, understanding and skills for the career of your choice. You will learn about the fundamental principles of business within a global context, principles that cover finance, operations, marketing and people management. This will enable you to develop key skills in leadership, managerial decision making and problem solving. In the second stage of your course, you will begin to develop your chosen specialist expertise. You will establish the importance and impact of efficient marketing, developing the skills and insights of a successful marketing manager. Customers are at the heart of every business, and marketing places you at the centre of corporate strategy and its application. You’ll become knowledgeable in knowing how to make a company stand out from the competition, developing innovative brand and communications plans, while also developing skills in digital marketing in the final stage of the course. The final core Major Project module is tailored to your career aspirations. The module provides three project options - a work-based study route enabling you to relate the project to a current employer, or a ‘consultancy project’ option where you find a client who has a marketing problem that you feel you can solve; or a traditional dissertation involving both the theory and practice of marketing. Whatever route you choose, it will give you the opportunity to identify a topic and industry of your choice related to your specialist area of marketing, tailoring your degree to enhance your employability for your final chosen career destination. Previous projects have involved fashion branding, customer relationship management in the finance sector and customer loyalty within sports marketing. You’ll be taught by highly qualified module tutors with significant professional practice experience in a range of management and marketing roles, including international marketing, marketing management, digital marketing and marketing consultancy. You will develop fundamental skills in business management, while having the opportunity to gain enhanced and specialist expertise to help you enter the exciting and dynamic marketing profession. You will work alongside a diverse range of international students, creating an exciting atmosphere and a range of ideas. You will have the opportunity to visit a leading service or manufacturing company, such as Jaguar Land Rover, helping you gain insight into the complexity of real-world global operations. You will be supported with business English language diagnostics and tutor support to help improve you in the international language of business. Candidates will be required to submit an extended application to evidence how their Postgraduate Certificate meets the programme learning outcomes at the equivalent stage. Candidates will be required to submit an extended application to evidence how their Postgraduate Diploma meets the programme learning outcomes at the equivalent stage. Candidates will be required to have passed a research methods module (Level 7 or equivalent, minimum value of 20 credits) and will be required to submit an original Dissertation Proposal that has been passed by the Programme Team prior to admission approval. 2:2 or higher Honours degree or equivalent. This module aims to develop your understanding of the main financial objective of the firm i.e. wealth maximisation and how it is achieved through alignment of financial decisions under constraints from within and outside the organisation. The module covers topics such as financial statements analysis, budgeting, cost-benefit analysis, time value money, investment appraisal, working capital management, sources of capital and choice of capital structure. The aim of this module is to provide you with the key knowledge and understanding of the integrated nature of business functions focusing specifically on marketing and operations. It will give you both a foundation in what business is and how it operates using these two key functional perspectives whilst also highlighting leadership and financial implications of managerial decision making in these areas to provide an integrated and holistic view of business in a variety of contexts. This module will provide you with an opportunity to engage and consider contemporary issues in leadership from both UK and international perspectives and how leaders address these within organisations. The module will enable you to develop a critical insight and outlook in order to explore relevant solutions for organisational effectiveness and success. International Strategic Management is a core module for all MSc business pathways. Strategy is a field that breaks you out of a functional perspective and integrates the functional Stage 1 themes of finance, marketing, leadership and operations to offer a holistic view of an organisation, be that a small or medium sized business or a large corporation in an international context. The focus of this course is on the business unit level or competitive strategy, not corporate level strategy. 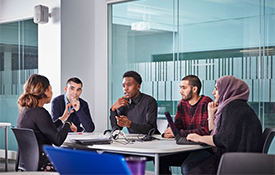 The Major Project provides the practical and theoretical focus for the MSc Management programme and is the culmination of your programme of study. The aim of this module is to provide a framework for you to undertake a substantial piece of disciplinary-relevant research. It is founded upon Birmingham City Business School’s teaching and learning philosophy which integrates theory and practice. This module examines the management concepts and practices related to product and service branding, specifically the detailed underpinning necessary to understand the building blocks of brand management and building brand equity. The module also provides the skills needed to critically analyse, evaluate and create an integrated marketing communications plan. This module aims to equip you with the conceptual knowledge needed to further develop your understanding of digital marketing strategies. It explores a diverse range of activities within digital marketing strategy and aims to enable you to appreciate the major differences between traditional and digital marketing activities at a strategic level. The Research Project Management module looks to provide you with the necessary knowledge and skills to manage projects more efficiently within your workplace role, focusing particularly on how project management tools and techniques can be used to manage commercial research projects. This module is designed to give you the research skills and insights necessary for the study and investigation of business organisations and business-related data. These skills will impact directly on your ability to understand and evaluate information from a variety of sources and where appropriate undertake primary research. You will become aware of the many tools and techniques that can help judge and interpret research outcomes. The course runs for 12 months (full-time, September start) and is split into three stages, each lasting at least 10 weeks. Assessment is of a practical nature, including assignments, reports, presentations and examinations. Each module consists a mixture of lectures, seminars, workshops, online interactive activities and assessments. Typically each module is taught on a weekly basis during term time, consisting of three hours per module per week split into one, two or three-hour sessions. A total of 9 contact hours per week is typical over a 10 week period for Stage 1 and Stage 2. Stage 3 will consist of three hours of contact time per week, supplemented with project supervision meetings as and when required for the Major Project. Each 20-credit module is designed to require 200 hours of study, of which 30 hours or more will be via direct contact with module tutors. The remaining time will consist of independent learning, which will be structured with guidance from the module tutor to incorporate activities such as online learning, reading and group or team based work. Emphasis will be placed on the group as a resource for learning. There will be group discussion of practical management situations and problems, making use of case studies, problem situations and scenarios and, where relevant, the participants' own experiences. Assessment on the programme is designed to be an integral part of your learning process, enhancing and demonstrating your knowledge and practice. Formative feedback will be provided to you through a combination of self-reflection, peer group and tutor feedback. Summative assessments will provide a measure of the extent to you have achieved the learning outcomes of the modules. Assessment within the modules will take various forms, including coursework assignments, reports, controlled assessment, examinations and the dissertation or project. You may be required to defend the dissertation or project through a viva, drawing on the skills developed in the programme. I enjoyed my studies very much. During the five-week pre-sessional English course, I got along well with my classmates, who came from all over the world. The most exciting things were the travelling arrangements made for us – it was a good way to make friends and get familiar with the country and its culture. I found that the tutors were helpful. There were plentiful resources for me to access, such as international advice and career advice. There were also courses run for international students to help them with their academic study. With the help of the Students’ Union, I did meaningful voluntary work, which made my university life more colourful. All of our Management pathways have professional accreditation from CMI, as well as ensuring the courses are relevant and cutting edge, it means also means you will receive a CMI QCF Level 7 Certificate in addition to the Masters degree upon graduating. You’ll be provided with CMI membership for the duration of the course, benefitting from full access to ManagementDirect, CMI’s market-leading online support tool for managers and leaders. You’ll also be eligible for the CMI’s mentoring scheme and have the opportunity to attend events, helping you network and create industry links. We also have accreditation from CIM, with two Marketing pathway modules mapped to the CIM Level 6 Diploma in Professional Marketing, achieving the maximum number of exemptions from the CIM Diploma. On completion of this course, you’ll have the opportunity to attend a four-day block module course which will prepare you to sit the two further exams required to achieve the Diploma in addition to your Masters degree. *Additional costs for CIM accreditation to cover tuition, assessment and membership are not included in the course fee. Having worked at Land Rover and then the merged Jaguar Land Rover (JLR) in various roles, Rob Cooney is currently Jaguar Marketing Manager for JLR's Engineered to Order Division – responsible for extending the brand with a series of special editions and personalisation options. Working alongside marketing experts from across a wide range of sectors and brands, I was able to benefit from a wide range of perspectives on approaches to marketing, while I was able to draw on my own experience for my main project, based around the LRX concept vehicle, which subsequently became the highly-successful Range Rover Evoque. Take part in a funded company visit to a leading company, such as Jaguar Land Rover, one of the most successful and lucrative businesses in the world. Choose to deliver a work-based study project or consultancy project in the final stage of the course using a current employer or a client you find yourself. Seek support and engage with events and activities provided by Birmingham City University’s careers service. Take part in Birmingham City University’s Graduate Plus scheme. Receive employment advice and support via your Personal Tutor. Our graduates have obtained employment in management positions, or have set up their own successful businesses. Former students are employed in managerial positions across the globe, including land management (Kenya), manufacturing (China), HR (Germany), finance (Canada), insurance (France) and teaching (India, UK and Sri Lanka). You’ll learn new perspectives on a changing business world, enabling you to provide employers with relevant and cutting-edge information. The research skills you develop doing your Major Project will also look good on your CV. A postgraduate qualification can really help you stand out from the crowd in today’s competitive job market. By becoming a specialist in your field, you’ll have the chance to advance thinking in that subject and lead, rather than follow, the latest developments. Our students have blossomed in jobs due to our course’s in-depth study of management, business and the international marketplace. One such graduate is Akilhesh Jain, who upon graduating had the opportunity to join a multinational company or join his family business in India. Electing for the latter, he joined as a marketing manager for his family’s Trinity Group business. He is now Vice-Chairman of their reinsurance broking company, as well as leading their strategy and planning. He now has 200 people working under him, manages six domestic and two foreign offices and the company now has a turnover of $40 million. Barny Morris has worked at senior level on advertising accounts for companies such as Sony, SEGA, Turtlewax and PZ Cussons. Barny is the MSc Management Course Director, and is currently working on research and in-company teaching projects within the hospitality sector on service design and marketing with companies such as Greene King, Saint Gobain and Mitchells & Butler.